We all know how important Munich is to United fans. Which is why the 50th anniversary of the Busby Babes tribute assumes priority over anything for us. We also thought it was great to actually see the Glazers willing to allow the team to sport jerseys free of sponsors for the tribute game, incidentally against Citeh. Doesn’t the appearance of the AIG logo stink? They got the shirt deal and all that. But it has been made clear everywhere that no one should be allowed to make any commercial gains from the Munich tribute. It is a tragedy that is meant to be beyond petty advertising and attention crabbing whores. It is for the families/players affected by the tragedy and for the fans. And this is why the presence of the AIG logo, however inconspicuous they intend to make it look, concerns me. It shows a total lack of understanding on not just the part of the owners; we really don’t expect them to know too much, do we? But it is appalling that people like David Gill, who do have some say and understanding of the sentiments of fans, seem to have ignored this detail. And not just that. How could they even get the words of United Calypso wrong? It’s okay if it was a typist rattling away on his keyboard trying to meet some article deadline. But in full blown panels that occupy the East Stand facade of OT that’s just unforgivable, and terribly negligent. It would certainly be grating for fans entering the premises. Before I end my rant, here’s a petition (to take off the AIG logo) that I would request every one to sign. The official site has recognised the error of the text already and hope to correct it. So there is also a chance that the AIG logo could be taken down. So go ahead click here, and sign the petition. Quick. I will come up with the match report later in the day. I haven’t forgotten that! Update: The club has just issued a statement regarding the AIG logo. That is hardly reassuring to me. It is very easy to say that you brought the Busby family on board for this one. You wouldn’t expect the Busby family, in their moment of grieving, to be too bothered to be saying anything about the details on how they wished to have their tribute. It is upto us fans and the management to give them the respect they deserve. So I really don’t like the sound of the club statement. To me it’s plain wrong to have a corporate logo on a tribute, however philanthropic they maybe. And in this case, I am pretty sure insurance companies don’t rank too high on the goodwill scale. While I agree with the principle, the whole petition idea makes us sound like a bunch of Liverpool fans. While not the most tasteful bit of advertising/logo placement in history, I think some fans (not aimed at you RR) have blown the issue out of all proportion. Given the gestures shown by Nike and AIG over the commemorative shirts, I think they should be cut a bit more slack than they are currently getting, for what may simply be an unfortunate oversight. Not sure if you read the update to my post. The club just issued a statement. And the statement is hardly reassuring. Personally I am against things like fans vandalising Gill’s residence and cretinous stuff like that. But in a civilised society, a petition is a much better way to voice a disagreement. It gets the message through — or atleast attempts to, in a peaceful manner. About AIG and Nike – with the amount of advertising they do on a daily basis, I really don’t understand why they would have to stick their nose in somewhere. If I would really feel for someone, I would do things in the background and give the respect that person deserves. Not try to steal his day by trumpeting my name around, saying that I was the reason this tribute is happening. Anyway, here there was an agreement that no one should attempt to use this tragedy to score points and the AIG symbol is something that doesn’t seem to be upholding that agreement — if there ever was one. Agree about the AIG logo, absolutely shocking stuff by our sponsors. No sponsorship should be on that memorial. Sorry didnâ€™t see the update before I posted. While I’m not a fan of the move, if it has been cleared off with people such as the Busby family then who are we to argue? The logo while a bit tasteless isn’t particularly intrusive. The suggestion that there was no agreement is a bit harsh. Both AIG and Nike have been very cooperative in the planning for the tributes to dates. It seems like all it has taken is one small logo to undermine all the goodwork done to date. To be honest given the amount of money they pump into the club it would be hard to say no if Nike or AIG asked to put a logo on SAF’s forehead. I think you have blown it out of proportion RR. I saw the sign yesteday and in all the press and didnt even notice the logo. By starting a petition on this, I agree with JB, makes us look like a bunch of whinging, whining dippers. Would they take any notice anyway? You will argue that isn’t the point, but perhaps drawing everyones attention to the logo by starting petitions just backfires. I aint a whinger about this stuff and personally, I think YOU are degrading the memory of the Babes, by making an issue of it. I don’t know why people are complaining so much, AIG agreed to drop the advertising for the match, which they pay millions to have. 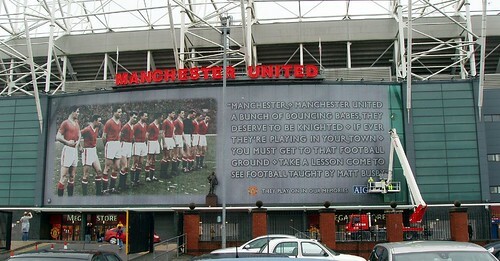 and paid for the tribute picture to be put on the front of OT. where is the mistake in the calypso? For the record, I hadn’t started the petition. About your question on whether they’d take notice anyway, well they did issue two statements in response to the discontent – one for the error in the United Calypso text and the other about AIG logo’s presence in the panel. Personally I am not for having the logo which is why I was a little annoyed when I first saw it. Hence the rant. I am sure I may have written a more restrained post had it been like sometime now. But the point is, during this event, I didn’t want to see any sponsor. Period. AIG and Nike can flood us with their ads for the rest of the year and future years to come. But can’t they not do it for this one day? Fair play to them for keeping the derby game ad free though. we’re going to advertise on a tribute of deaths, nobody will be upset by that. pathetic. and its just shamefull getting the text wrong, you might think well they agreed to drop the ss for a match but hello, they’re paying us, if they dont like the fact that we would like a bit of dignity during this short period of time then they pee off, im shor it wouldnt be that hard to find another ss lol. They are dropping the shirt sponsorship for the match. And I’m sure it wouldn’t be very easy to find as good a deal as we have with AIG. yea, they could of dropped the ss for the calypso 2 hence short period of time. i dont see the mistake in the calypso neither!! Red ranter if you dont mind may you pleas point out the mistake in the calypso? The error is that there should be a Busby infront of the word babes. What is it with all the bashing of the Glazers? I am growing a bit tired of it myself. They have shown themselves to be class acts in my opinion and not the horrible greedy monsters portrayed by many. I don’t want to come off criticising Red Ranter because i love his and Ahmed’s articles a great deal. Just seems trivial to criticize every possible misstep of the owners. Nobody is perfect you know. On a side note, where is the Newcastle match review? I have been looking forward to it for some time. Please don’t bash me or take my comment the wrong way. I LOVE this site and I do appreciate that these articles take a decent bit of time to write. I just feel that we could have ended up with a crazy russian billionaire or some greedy owners who meddle (Gillette and Hicks) and that overall the Glazers have proven to be alright. I look forward to United challenging on three fronts en route to the treble this year. I agree about the petition RR. I wouldn’t like if someone put my grandfather’s picture and put a sponsor’s logo on it. Especially on the day he passed away. getting a massive financial damage. Just ONE day without any advertising. It’s not asking too much, It’s asking for remembering legends in the proper manner. Scumbags i wonder how cold hearted man utd executives have become over the years a$$$$les. At the risk of sounding like a whinging scouser I fully agree with you. Any advertising on a tribute to the dead is completely wrong. Yes they give us a great sponsership deal and they are entitled to put their logo on just about anything United… But not this, surely. Every man and his dog line up to shoot us down for ‘cashing in’ and ‘milking’ our history. Why do we keep providing them with ammo? I am curious about how many of our glorious support took the time to write an email to thank AIG for the generous offer to remove their logo from the kits for the anniversary. Probably about the same number who thanked Nike for designing the new kit and not then not marketing or selling it. The same people also most likely failed to acknowledge the PL for allowing their rules to be broken for the tribute. The clubs sponsors are not obliged to do any of the things planned for the Munich tribute. 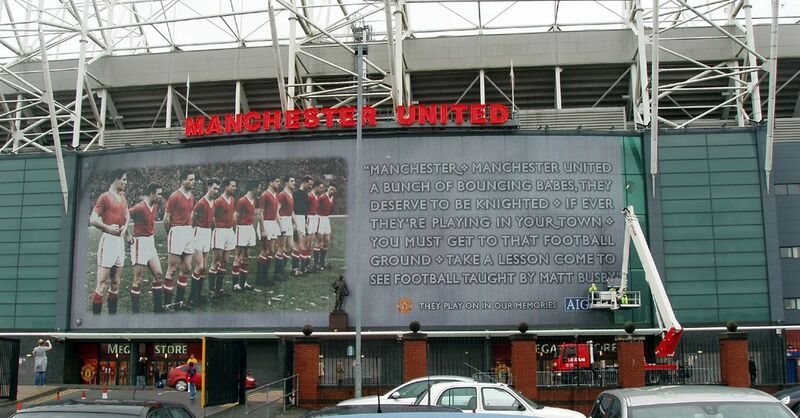 AIG didnâ€™t have to fund (if my source is correct) the tribute on the East Stand. Nike didnâ€™t have to design a new kit either. But they did so out of due respect to the dead from the disaster. It is interesting to note that while the logo placement makes AIG go down in peoples estimation, their other gestures seem to have had little positive impact. Hell why donâ€™t they just take the whole damn thing down, that would solve the problem completely! Just curious, so you wrote an email to thank AIG? Fair play to AIG&Nike for their part. But these are business partners with United. like Nike designing a new kit and such. to acknowledge them on every occasion, so I don’t even know why you are mentioning this. Or do we? You tell me. People should cut them some slack. They are trying their best to pay their respects to the memories of the Busby babes. Granted they’ve made a mistake or two..but who hasn’t in this life? Especially regarding a culture or history that isn’t your own? JK: No I didn’t write them an email, but I didn’t send one whining about the presence of a small logo either. Nike and AIG may benefit from the relationship with us, but they pay a hefty price for it. And the fee they pay entitles them to slap logos all over the shop. On this occasion they have declined to do so despite their contractual rights. I am not suggesting that our support acknowledge them on every occasion, as there is no need or reason to. However it seems they canâ€™t even take the time to do so when there might be a good reason. And while AIG are not running a charity removal of logos from the kit for the anniversary is a charitable act. One of which our â€˜gloriousâ€™ support has responded to by reportedly vandalizing an AIG office in Manchester yesterday. You would wonder what disrespects the dead of the Munich air crash more, crass commercialization or criminal activities perpetrated in their nameâ€¦â€¦. Really now, AIG and Nike have the right to do what they want after all they paid big bucks for it, but they instead decided to honor the busby babes by taking off their logos on the kits. I do not see the problem in them showing support for the busby babes by putting their logo. Just like if you donated/sponsored something in memory of someone…I doubt you would have an issue with your name being put there….In a nutshell you first have to determine if the logo was put there to show solidarity or for commercial reasons…. everyone talks bout AIG benefiting, maybe thats your view…they (AIG) might be truly looking at it as showing their solidarity in remembrance of the BUSBY BABES…i just think the guy who wrote this is letting his anti capitalism sentiment get in the way of the true meaning of this time/event/memorial…. Of course I’m against vandalizing an AIG office. similar level, so I don’t want neither. occasion. So these fans are doing a petition. What’s wrong with it? I just want to ask them to remove their logo just one day in a year. JK: I’m not suggesting you do support vandalizing AIG offices, but I have to differ on the next point, I consider criminal activities far worse than commercialization. I donâ€™t have a particular problem with the concept of a petition. I do however have an issue with our fan base being so quick and vehement in their response to the issue (this is not aimed at the contributors to this blog specifically) without acknowledging or giving any credit to the other more than ample demonstrations of goodwill by AIG. WOULD WE RATHER HAVE A CLUB LYING IN A 7TH OR 8TH PLACE EVERY SEASON WITH NO FINANCIAL BACKING BEHIND US,OR WOULD WE RATHER BE WHERE WE ARE NOW(SUCCESSFUL IN CASE ANTI GLAZERS ARE TOO BLIND TO SEE).HAVE THE GLAZERS REFUSED FERGIE ANY MONEY,HAS THE CLUB PROFITS INCREASED,ARE WE NOT AS BIG A WORLDWIDE ATTRACTION THAN WE HAVE EVER BEEN.SO WHATS THE PROBLEM?ANTI GLAZERS THINK AGAIN. what money has glazer given the club? money the club spent was generated with the sale of players and and increased ground capacity,you ask anti glazers to think again the man has increased ticket prices rapidly to the exreme that people can no longer afford it,the club is in massive debt no matter what we r lead 2 beleive,we were a success and worldwide attraction witout him so how has he enhanced attraction?we are in the hands of mercinaries. Commercial gain? Have you looked on ebay today? ?